The LMA has done our due diligence. More research on acceptable risks may sound good, but in my experience this request is usually a stalling tactic. We do not need more research on the safety of these products. Here is why I think that. First of all, the chemical products that are used in the milfoil control program are registered for use by the United States Environmental Protection Agency, which conducts extensive research before allowing any herbicide to be allowed for use. In addition, the herbicides are permitted by the Minnesota Department of Natural Resources. · Over 180 peer-reviewed scientific reports and technical documents on file with the US EPA. · Over $100 million dollars have been invested in development and scientific regulatory studies to meet data requirements of US EPA herbicide registration. · The US EPA uses these assessments in their evaluation process: Residue Chemistry Data, Environmental Fate Data, Degradation Studies, Metabolism Studies, Mobility Studies, Dissipation Studies, Accumulation Studies, Hazard to Humans and Domestic Animals, and Teratogenicity Studies, Mutagenicity Studies. · An acceptable toxicity level for humans is defined as the level of pesticide present in fish or water in which a lifetime of human consumption is not likely to cause adverse health effects in humans. · Environmental tolerance levels are determined to have “no observable effects” in animal diets and quantification of residues in fish and water. The LMA (or any other local or state agency) does not have sufficient resources to do a credible, objective job over-and-above what has already been done. Indeed, we would submit no additional tests or research are needed. The LMA believes that there are no other feasible (non-chemical) control options that accomplish our management goals, which are to control milfoil in a safe manner without harming native plants. Selective hand-pulling of milfoil, which we know can be very effective, is not feasible. Waterfront Restoration offers hand-pulling milfoil control services. Their owner, Tom Suerth, estimated costs between $6,500 and $17,400 per acre for this service. This compares to less than $500 per acre for herbicide control. Selective hand-pulling is very effective and many lakeshore owners value this service, but it is cost-prohibitive for larger-scale projects. Similarly using milfoil weevils for selective milfoil control is not feasible. The Minnehaha Creek Watershed District has funded (about $5,000) a small-scale pilot project overseen by a concerned citizen. However, the Minnesota Department of Natural Resources has invested over $1.3 million dollars spanning ten years for a University of Minnesota researcher to evaluate whether milfoil weevils could be an effective milfoil biological control. That research is no longer funded as weevils did not control milfoil on any kind of operational basis. Unfortunately, the weevils are readily eaten by bluegills. Finally, harvesters are not an alternative to selective milfoil control. The harvesters are not selective and that program is designed to facilitate navigation in critical areas and not to control milfoil. So, the LMA believes the use of herbicide in this project is safe and there are no other feasible alternatives. We appreciate some may prefer other methods or no control at all; however, on an objective, scientific basis, we know the risk to public and environmental health is very small. The EPA uses a criterion that there be less than one chance in a million for these products to cause harm. To put this into perspective, we have a one chance in one hundred of being killed in a car accident in our lifetimes, a risk that millions of people readily accept. So, in contrast, the risk than of being harmed by aquatic herbicides is at least 10,000-times smaller. 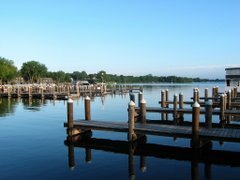 The Lake Minnetonka Association wants Lake Minnetonka to be healthy and enjoyable for all. On balance, we believe the use of herbicides in this project represents minimal, acceptable risks.